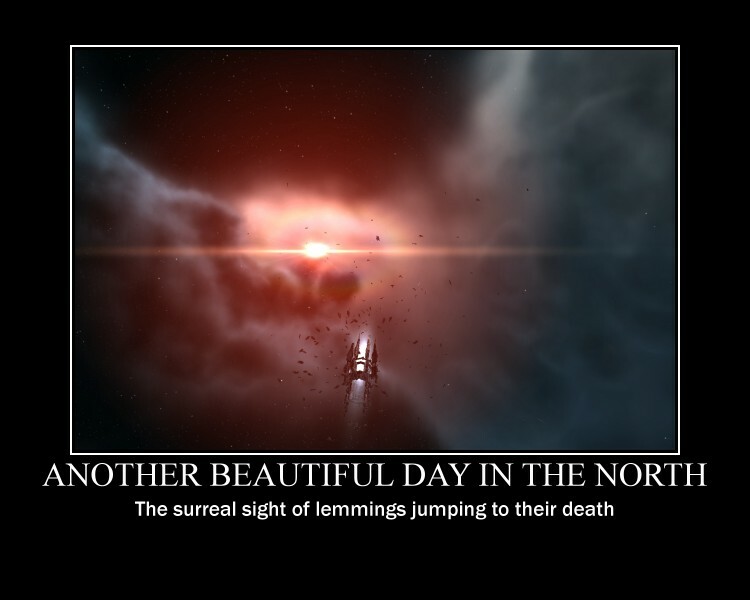 "The North" refers to the Northern part of the fictional Eve star cluster from Eve Online, specifically territory held by the player-run Northern Coalition power bloc. "Jumping" is the act of using a stargate to transport one's space ship from one star system to another one. Active stargates emit impressive quantities of light. 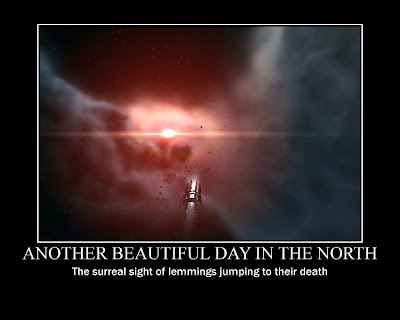 "Lemmings" has been adopted into Northern Coalition fleets to designate players who carelessly and/or unknowingly disobey orders to hold on the gate and instead jump to the next star system, probably to be ruthlessly dispatched by an enemy fleet. "Do not pronounce the J word" refers to the fact that, in "military conditions" (bad audio system, fleet commander is not native English speaker, did not pay attention anyway, watching TV at the same time, choking on noodles while piloting one's ship, somebody spoke on corp comms at the same time, wife screaming, oh my god revolutions in Arab countries), it is imperative to assume that when you utter the words "Do NOT jump. The enemy would kill you!" a statistically significant number of players will notice that your sentence includes the word "Jump" and thus will jump. Then somebody else notices the activating stargate and thinks "everybody is jumping! I will not be the last" and you get the so-called jumping-off-a-cliff lemming effect.